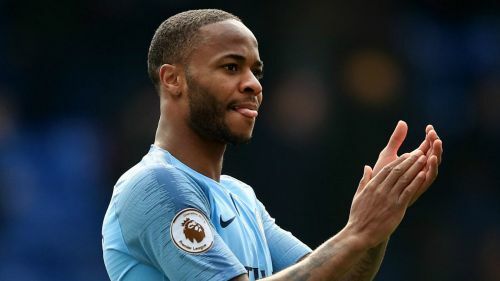 Manchester City matchwinner Raheem Sterling and manager Pep Guardiola showed little interest in watching Liverpool's clash with Chelsea after their 3-1 victory over Crystal Palace at Selhurst Park. Sterling scored twice to put City in charge against the Eagles and Gabriel Jesus sealed the victory with a third after Luka Milivojevic pulled one back for the hosts, as Guardiola's men moved a point clear at the top of the Premier League. With Liverpool playing Chelsea at Anfield later on Sunday, both Sterling and Guardiola were asked whether they would be watching their title rivals, but neither seemed keen. "I'm hungry," Sterling told Sky Sports. "I need to eat food - will see how it goes." Guardiola, meanwhile, had plans to watch the Masters, with Francesco Molinari and Tiger Woods in action on the final day. "Tiger Woods and Molinari are playing, so maybe we're going to see both," said Guardiola. "But hopefully Chelsea do a good job." PEP I am so pleased after the amount of games we have had. We played so well for 75 or 80 minutes and then they scored and we lost a little control for a few minutes but I am really pleased. We expect Liverpool to win all of their remaining games. City face Tottenham in the second leg of their Champions League quarter-final on Wednesday, before hosting Mauricio Pochettino's men again in the league three days later. Guardiola admitted his side are not infallible, having lost the first leg to Spurs in north London, but backed them to take maximum points from their remaining five league matches. "Of course we can lose. We are not unbeatable. We have our weak points. We have to win all the games. We think Liverpool are going to win all their games. It's in our hands," he said. "We're going to try to win all five of the games we have left. Of course, they are tough games, Tottenham at home, [Manchester] United away, Burnley away, Leicester [City] at home, Brighton and Hove Albion away, but it's in our hands depending on our performance. "It's incredible, this kind of pressure. We are fighting to be back-to-back champions. We have 83 points with five games left. Why should I doubt these players?"